Fruit-Powered Digest has blossomed as a free natural health magazine with a focus on a raw food lifestyle for all health seekers since its small October 2012 launch. I know it’s creating an awakening when some among the magazine’s thousands of readers worldwide tell me that one or more of the Digest’s 100-plus Transformation stories has inspired them to go or stay raw. Or that an article opened doors in their lives to new ways of thinking about their connection with nature, the state of the environment or how to grow as a person. I want to continue producing Fruit-Powered Digest for a long time to show the whole world a fruit-based raw food diet is for all to adopt to feel their best. For this e-magazine to be sustainable as a business venture and help continue feeding positive global change, I need the help of all the Digest‘s readers. Newspapers and magazines across the globe have gone out of business since the mid-2000s because Web-based advertising can’t even remotely match the dollars print, radio and television advertising command. Additionally, most websites fold within a year or two because it takes not only a lot of work to produce quality content but a considerable amount of money. Without financial support, it’s challenging for most to continue investing in their online presence. 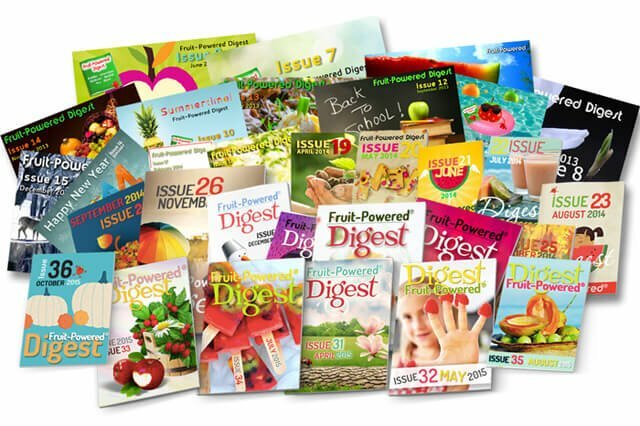 Consider this: The Fruit-Powered Digest archive boasts more than 700 stories, but all this brings in on average just $20 a month in advertising commission. You read that right—$20—and I’m still making this content available for free because I believe the world needs this magazine! This is where you, dear readers, come in. Each year, if every subscriber contributed just $10—less than the cost of a single main course at most raw food cafés—Fruit-Powered Digest would flourish well into the future. I assure you that every donated penny will support my efforts to produce and promote Fruit-Powered Digest as well as myself, the person who packages the magazine, from vision to delivery. I plan to devote at least 200 hours over the Digest‘s 2017–18 publication year developing four seasonal issues, with another 50 hours spent promoting the magazine every week on social media. In producing the magazine, I will incur thousands of dollars in expenses—from website hosting fees and a newsletter service to beautiful photographs and illustrations purchased from a stock image bank—to bring the Digest to life. With your support, I plan, for the Digest‘s sixth year, to publish 40 combined In Season pieces, Closeup interviews, Spotlight features and revealing, powerful Transformations, giving a platform to folks around the world who changed their lifestyle to benefit the planet, other creatures and themselves. The Digest also brims with Top Tips, Recipes and regular guest stories by these leading voices in the health community: Brian Rossiter, Don Bennett, Alicia Grant, Chris Kendall, Dr. David Klein, Tarah Millen, Anne Osborne, Karen Ranzi and Paul and Yulia Tarbath. You may support Fruit-Powered with one-time donations—and it’d be wonderful if you can set a calendar reminder to contribute during succeeding years. Those offering one-time donations of $50 or more will receive special gifts, showcased below. Do you want to support Fruit-Powered Digest but are on a tight budget? You can support the magazine by clicking on this banner each time you shop on Amazon.com, and invite family and friends to do the same. You can also encourage family and friends to subscribe to the Digest for free! 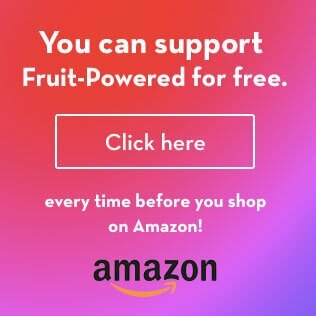 Fruit-Powered is an Amazon affiliate, receiving small commissions on purchases. By clicking on this banner, you do not pay a penny more for your purchases. These gifts are meant to thank you for going the extra mile in supporting Fruit-Powered Digest. 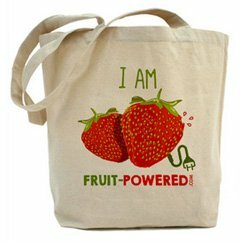 $100 to $299.99: A specially made “I Am Fruit-Powered” canvas tote bag and my four-volume Mouthwatering Recipe Book Series (e-book format). 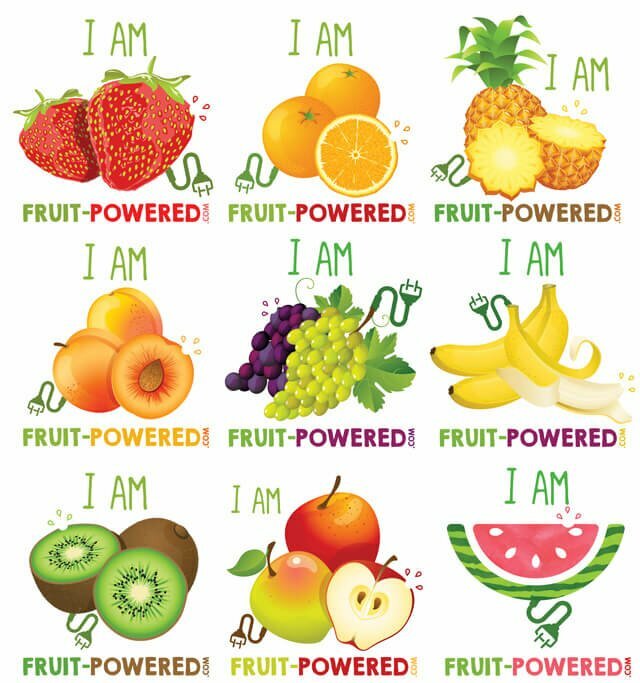 Choose your design from (from upper left): strawberries, oranges, pineapple, apricots, grapes, bananas, kiwi, apples and watermelon. I will e-mail you directly to find out which design to order for you and to send you gifts. $300 and up: A one-hour Fruit-Powered Lifestyle Coaching Program session for yourself or a family member or friend, a specially made “I Am Fruit-Powered” canvas tote bag and my four-volume Mouthwatering Recipe Book Series (e-book format). 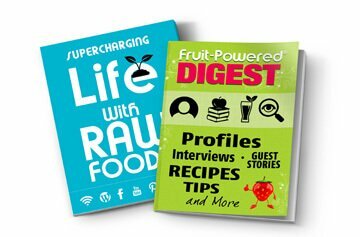 I’m thrilled to bring you much more of the inspiring and illuminating stories, interviews and other content you love in Fruit-Powered Digest! Thanks for your support! Not Yet a Digest Subscriber? Join My Mailing List!